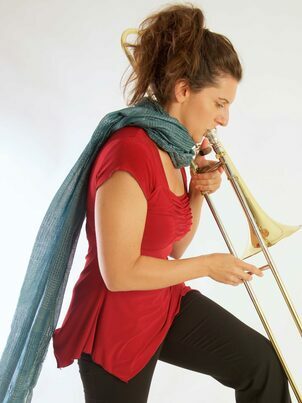 Jen Baker, trombonist/composer/improviser, collaborates with dozens of artists through solo commissions in site-specific performance, concert halls, and in theatrical/mixed media settings. She has appeared in festivals internationally and nationwide with new music ensembles S.E.M., TILT brass, and the mobile ensemble Asphalt Orchestra. A sought-after improviser, her work in multimedia and contemporary chamber music has led her to performance with Merce Cunningham Dance Company, Karole Armitage, Brooklyn Ballet, art gallery performances at the Met and the Guggenheim, and High Zero - an international festival of improvised music. As a composer, Baker often writes modular pieces, including First Nation's Ley-a Concerto for Multiphonic Trombone (co-composed with instrument-maker David Samas), performed as a telematic piece and as a duo. She is particularly interested in assisting the body's (as well as the Earth's) natural ability to heal itself and composes for this purpose. She is also featured on the soundtrack to Werner Herzog's Oscar-nominated Encounters at the End of the World, and appears on New World, Innova, Cantaloupe Music, Rastascan, and her own label, Dilapidated Barns. American pianist Steven Beck continues to garner impressive acclaim for his performances and recordings worldwide. Highlights of the 2014-15 season include the premiere of a new piano work (composed for him) by Charles Wuorinen, as well as a new project recording all of Babbitt's vocal music, beginning with the great Solo Requiem. In addition, he will again perform on the New York Philharmonic Ensembles series, and repeat his annual performance of Bach’s “Goldberg Variations” on Christmas Eve at the Barge; this has become a New York institution. Mr. Beck is a frequent performer of contemporary works; he has worked with Elliott Carter, Pierre Boulez, Henri Dutilleux, Charles Wuorinen, George Crumb, George Perle, and Fred Lerdahl, and performed with ensembles such as Speculum Musicae, the Metropolis Ensemble, the New York New Music Ensemble, and the Da Capo Chamber Players. He is a member of the Talea Ensemble and the Knights. He is also a member of Quattro Mani, a piano duo specializing in contemporary music. Mr. Beck’s discography includes Peter Lieberson's third piano concerto (for Bridge Records) and a recording of Elliott Carter’s “Double Concerto” on Albany Records. The debut CD of his chamber ensemble “Pleasure is the Law” was released on Boston Records in 2009. Grammy Award-winn ing violinist Karen Kim is widely hailed for her sensitive musicianship and passionate commitment to chamber and contemporary music. She has performed extensively throughout North and South America, Europe, Asia, and Australia, appearing in such venues and concert series as Carnegie Hall's Zankel and Weill Recital Halls, Lincoln Center, and the Brooklyn Academy of Music in New York; the Smithsonian Chamber Music Society and Library of Congress in Washington, DC; the Celebrity Series of Boston; the Philadelphia Chamber Music Society; the San Miguel de Allende Chamber Music Festival in Mexico; the Vienna Musikverein; London’s Wigmore Hall; the Musée d'Orsay in Paris; the Seoul Arts Center; and Angel Place in Sydney. Her recordings as a founding member of the Parker Quartet from 2002 to 2012 include the complete string quartets of György Ligeti, which received the Grammy Award for Best Chamber Music Performance in 2011. 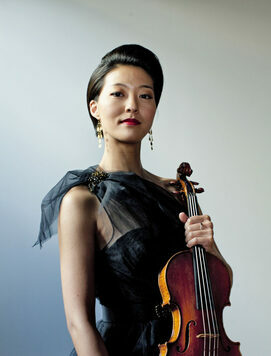 With the Parker Quartet, Karen Kim also received the Grand Prize and Mozart Prize at the 2005 Bordeaux International String Quartet Competition. Esteemed for her versatility across a broad spectrum of musical idioms and artistic disciplines, Karen Kim has collaborated with artists ranging from Kim Kashkashian, Paul Katz, Roger Tapping, Jörg Widmann, and Shai Wosner to Questlove & The Roots and the James Sewell Ballet. She frequently performs with such groups as the East Coast Chamber Orchestra, East Coast Contemporary Ensemble, Cadillac Moon Ensemble, Metropolis Ensemble, NOVUS NY, and Chameleon Arts Ensemble. She is also a devoted advocate of the music of our time, and has premiered works by Lera Auerbach, Wang Jie, Jeremy Gill, Patrick Castillo, Conrad Wilson, Craig Woodward, and others. 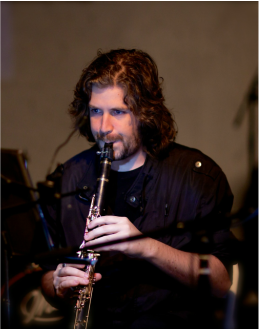 Liam Kinson is an Australian born clarinetist who began playing at the age of 12. His first clarinet teacher urged him to begin learning extended techniques from the very beginning, and this naturally led to a love and passion for contemporary classical music which he eventually moved to New York to pursue. Liam received his Masters in contemporary performance from the Manhattan School of Music, studying with David Krakauer, as well as a Bachelor of Music back home in Perth. Liam is one of the founding members of TAK ensemble, an ensemble dedicated to giving virtuosic and energetic performances of new and exciting music, and with them has played at many performance venues in New York City including Roulette, Invisible Dog, The Dimenna Center and Spectrum. He also freelances in the new music world, and has played with the likes of Wet Ink, Ensemble mise-en and Ensemble Moto Perpetuo. Ben Ringer has been seen performing in various guises for the last decade in New York City and the surrounding area. A native of Portsmouth, VA, he moved to New York in 2004 to attend Mannes College: The New School for Music; he holds Bachelors and Masters of Music degrees from Mannes. As clarinetist Ben has performed with a varied bunch of ensembles including The Chelsea Symphony, Ensemble 212, The Columbia University Bach Society, and Alaria. A devotee of new and contemporary classical music, he is a founding member of Lunatics at Large (along with Rubato Music School founder Evi Jundt). A trained conductor, Ben has led performances at Carnegie Hall, Symphony Space, and Madison Square Garden; he is a former conductor of the New Jersey State Youth Orchestras. Not limited to classical repertoire, Ben recently served as music director for New Vision Players' 2013 production of Sondheim's Into The Woods in Paramus, NJ. 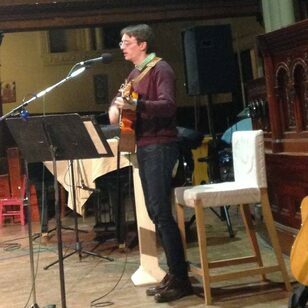 Ben can also be seen at various open mic nights around New York performing his original songs and playing acoustic guitar. Not only a performer but a devoted educator, Ben serves on the adjunct faculty at Mannes College: The New School for Music. He teaches lessons in piano, guitar, clarinet, and music theory at Musipire Professional Music Education in Queens, NY, and held the position of clarinet teacher at The Richard Rodgers of the Arts & Technology. In his rare moments of spare time Ben enjoys a good book and cuddling up with his cat Pixel. 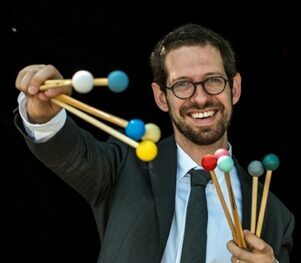 Included among the Village Voice's "Best of New York," percussionist Jonathan Singer has been praised for his "superb four-mallet technique" (New York Times) and described as an "artistic assault on the sensory order of nitrous oxide." 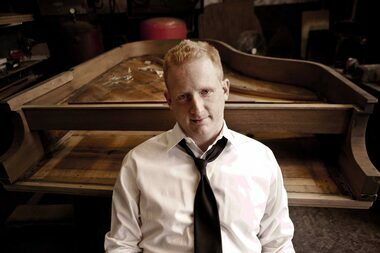 His solo appearances include performances with the Detroit Symphony and Grammy®-winning Nighthawks. As the leader of the Brooklyn-based novelty ragtime band, Xylopholks, Mr. Singer has performed across the United State, India, Japan, Brazil and Canada and on the stages of Alice Tully Hall, City Center, 92nd Street Y and the Metropolitan Museum of Art. He has been heard on WNYC, Air America and made on-screen appearances in Boardwalk Empire, Royal Pains and David Grubin's Downtown Express. Mr. Singer is the recipient of a Fulbright Fellowship and Queens College grant to study in India. Singer is currently on faculty at Queensborough Community College; previous faculty appointments include Queens College and Brooklyn College. He is a graduate of the Interlochen Arts Academy, Berklee College of Music, and Queens College and is currently a doctoral candidate at the CUNY Graduate Center.